I should probably say up front that I’ve seen six different stage productions of Into the Woods, and, like most fans of the musical (book by James Lapine, music and lyrics by Stephen Sondheim), I went into this Rob Marshall film adaptation both excited to see the show on the silver screen and nervous that it would join the long list of Broadway hits that became Hollywood mediocrities. Of course, Marshall did direct Chicago (2002), which has been one of the few successful Broadway adaptations of the last two decades, so it seemed, at least, that we should have been in good hands here. And for the first hour or so of Into the Woods, we certainly were. But the second half of the movie missed so many of the thematic high points that make the play such a special piece. I left the theater feeling like I had watched a perfectly competent adaptation, but not one that tapped into the full potential of its rich source material. The movie, like the play—indeed, like all fairy tales—begins with the four requisite magic words, “once upon a time,” and from there, we hit the ground running. 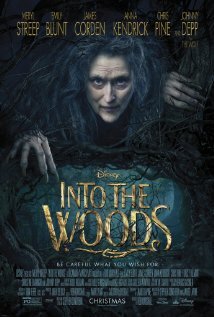 The opening number (“Prologue: Into the Woods”) is well executed on every level, and Marshall does an especially good job here of playing to the strengths of the film medium. During the Witch’s (Meryl Streep) garden rap, we actually get to see small flashes of backstory that in the musical are merely sung about. Throughout the film, these flashes are used to good effect, without feeling gratuitous. An important aspect of Into the Woods is how these characters collide and affect each other’s lives in powerful ways they don’t even realize, and to that end, there are some good moments during the opening number where we seamlessly transition, in a single shot, from one character’s story to the next. It is easy on a stage, in the extremely finite space of a theater, for these overlapping moments to seem incidental, but in the infinite world of film, these crossings of paths really stand out. The first half of the movie is fun, enjoyable, and visually striking, with enough clever bits to amuse even those of us who have seen the show half a dozen times, while also doing a good job of introducing newcomers to the woods. The musical number “Agony,” in which two princes charming (Chris Pine and Billy Magnussen) sing of their difficulties in wooing maidens fair, is particularly well done. Into the Woods is, at its core, about being surprised by the world you thought you knew. It’s about discovering new places in the woods, finding courage hidden deep within, and most importantly, learning that, even when wishes come true, the story doesn’t end. For the audience, too, the experience is very much about having expectations defied. The play’s real power comes from the second act, when the classic fairy tales take a dark turn away from the traditional versions we all know and love. And that’s precisely where the movie gets derailed. The play works because the dark turn feels believable. It works, in short, because time has passed. The fairy tales reach their classic resolution toward the end of the first act, and then there’s a musical number, and then there’s an intermission, and then there’s an opening musical number in the second act, and then things get dark. It’s clear that time has passed for the characters, and, since there have been two musical numbers plus an intermission since the plot has really advanced, about half an hour has passed for the audience as well. This gives the second half of the movie an inauthentic and frenetic feel. In the play, the audience and the characters had reached superficial conclusions at the end of the first act, before coming to something more raw and emotional in the second. But these secondary realizations and moments, which should feel important and powerful, just fall flat in the movie because we and the characters had never been allowed to come to the primary ones. Ultimately, my main complaints about the movie have little to do with the omissions the filmmakers made (although the lyric “If the end is right, it justifies the beans!” was especially missed); in fact, I think the desire to keep the show as intact as possible worked to the movie’s detriment. The second half felt like we were jumping from moment to moment so quickly simply because we had so many to get through. And as a result, so much of what is thematically important gets lost in the woods.